Founder and President of the Minsk-based Research Mises Center and the Executive Director of the highly-respected independent think tank Analytical Center “Strategy”. In 2010 he ran for president on a pro-reform free market platform. Mr. Romanchuk authored draft laws and reform programs for transitional countries. 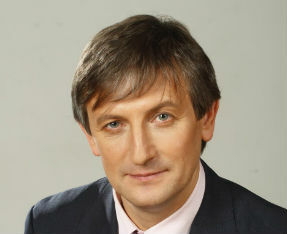 To date, he has authored more than 2,000 articles and co-authored 12 books on market-based economics and democratic governance, including a handbook that offers an alternative path of Belarusian development with free-market solutions in monetary, taxation, budgetary, social security and privatization issues. For two years he served as the Senior Economist of the Parliamentary Commission for Economic Reforms in the last democratically-elected parliament in Belarus (1995-96). Earlier in 1992-1995 he worked as a director of a private foreign company in Belarus. He also served as Vice-President of the United Civic Party (UCP), the largest opposition political party in Belarus, from 2000 to 2011. Sir Antony Fisher International Memorial Award for his book “Belarus: Road to the Future” (2006). From the epistemological point of view policymakers in transitional economies operated in the severely distorted information environment. Neither theorists or decision makers paid attention to the problem of economic calculation that was an integral part of a centrally planned economy and its immediate institutional followers in transition. Interventionists (political and government employees) made investment, production and redistribution decisions based on their subjective judgment and preferences trying to perform cyclical or countercyclical policy. Their knowledge of the business cycle as superficial and not based on a solid scientific base. In fact they considerable increased transformation costs and built fragile institutions prone to recurrent crises. Theorists of transition failed to single out the subject of economic actions – homo agens. Erroneously homo oeconomicus was taken as a doer and he was put in the frameworks of equilibrium models. Aggregate indicators of these models distorted the reality of actual discovery process by acting individuals even further. Macroeconomic approach to the analysis of transitional phenomena could not provide the information and insights that Austrian school of economics based on methodological subjectivism could. Interventionists focused their attention of neutralizing so-called market failures instead of emphasizing government failures and severe economic, social and institutional costs of state intervention. Interventionists created the whole vocabulary to justify their actions and outcomes. Vague concepts like social welfare or well-being, sustainable development, national interests were used to restrain political and economic competition, accountability of all cost and benefit outcomes in the SWOT analysis. The inclusion of theoretical achievements of Austrian school of economics into the analysis of transformation processes considerably broadens and deepens our understanding of both human actions in transformation and their outcomes.